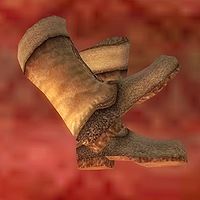 The Boots of Bloody Bounding are given as a reward for completing The Renegade Shadowscale, which is an optional Dark Brotherhood quest. The boots are one of the two in-game appearances of Pit Armor, a set of armor that was designed, but never put in the finished game, meaning that, had the armor been added to standard loot, this item would not have qualified as an artifact. Esta página foi modificada pela última vez à(s) 21h20min de 23 de março de 2016.